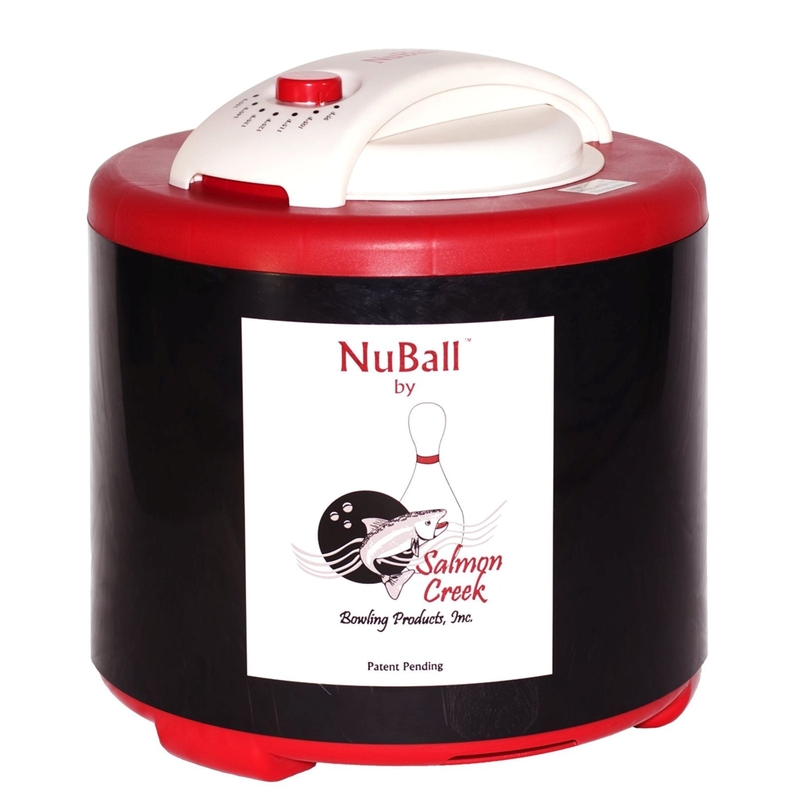 Just what you have been waiting for to prolong the life of your favorite bowling ball or balls. Custom cup/ball-stand allows heated air to circulate under the ball, and catches oil runoff. Questions asked by owners of NuBall have included the following. The top of NuBall is made for a different application. It would have required some expense - and more importantly, delay - to do the minor re-engineering that would have been required to remove the temperature control, or change its function. We wanted to make NuBall available to the public without delay, so decided to leave it alone. We are glad we did - see the following question. Not all our machines do. When the very first machines arrived from the factory, we tested them to ensure that actual temperatures attained inside the machine were in fact the temperatures indicated by the control knob. Some were accurate, and some weren't. Now we test every machine before we sell it. On those that aren't accurate, we find the pointer setting that does produce 135 degrees internally, and we apply a high-quality label so that 135 on the label is at the point where 135 is actually produced. Whether your machine has a label or not, setting the pointer to 135 degrees will heat the ball to that temperature, plus or minus about 3 degrees. About 40-50 percent of the machines we sell have such a sticker. The manufacturer is working on creation of a better thermostat. The answer is basically no. Visible oil on the surface of the ball will disappear very, very slowly. Usually, if you run NuBall for 60 minutes, you will get all of the oil out of the ball pores. If any remains, it will - logically enough - be fairly deep in the pores. When you use the ball, the top part of the pores will be oil-free, and the ball will act very much as though the job had been done completely. In that event, you might expect that the pores on your ball might fill up again sooner. Don't worry about it. Just follow the rule: if your ball hits weakly a couple of times in a session, and it hasn't been heated for a few sessions, run it through again. Running it through again costs you only a few minutes of your time, and it won't hurt the ball in any way. We doubt that this practice is worth the added effort, but it doesn't hurt anything. Some users have adopted the following practice, which seems effective. They run a ball in NuBall for an hour. If it gave out a lot of oil (maybe a teaspoon or more in the cup), they take it out, wipe it off, and run it in NuBall for another hour. This should completely clean out the pores of even very old or neglected bowling balls. Lane oil is mostly mineral oil, which is a byproduct of petroleum production. It can be somewhat toxic in significant quantity. Therefore it should be recycled much like motor oil, from a purist point of view. For more information, eHow has a great article on the matter. Note that baby oil is mostly mineral oil and mineral oil is taken by some adults as a laxative. The oil extracted from a ball in a typical NuBall usage is about a teaspoon or so. Each user can use his own conscience to decide whether to worry about the release of this small amount of oil into the sewer system. If you care to, you can check with your own state's regulations about disposal of mineral oil. Pearls soak up less oil than solids (though old pearls that are no longer shiny are every bit as bad as solids. If you wipe off your ball with a towel after every frame, your ball will accumulate much less oil. If you clean your ball after every session, your ball will accumulate much less oil. If you occasionally have your ball rejuvenated at a pro shop, it will contain only the oil accumulated since the last rejuvenation. If your ball is warmed by other means (in your trunk in summer, or sitting next to a heater, etc. ), it may have been partially rejuvenated by being in those situations. Some balls just appear to be more porous than others, and therefore pick up more oil. For instance, the Ebonite 250K series seem to absorb a lot of oil, while the Black Widow Venom seems to absorb comparatively very little. If the ball is not warm or has hot spots, then your machine might be defective. You can check by putting a thermometer in the machine. A candy or meat or oven thermometer can be used - any thermometer that can read between 100 and 200 degrees. Put the thermometer inside NuBall, put the top on, set it to run at 135 degrees and run it for at least 20 minutes. Then look at the thermometer - if it reads outside of the 130's, contact us for further advice. Don't worry. NuBall has a 2 year warranty. We will make sure your NuBall is running right, or we will send you a new part to fix the problem. We wanted to make NuBall available to the public without delay, so decided not to request that the factory make a change to the existing device. We will require an on/off switch as a feature of an updated model of NuBall. In the meantime, if you want to run NuBall in a timed manner, the Woods Import 5559206 Digital Countdown Timer is available. It will allow you to run NuBall 1, 2, 4 or 8 hours and shut off automatically. The top and bottom are parts of a machine originally designed for a different application. In that usage, they had to fit with a short center structure which had virtually no draft - that is, it was almost exactly columnar - the top and bottom of it were almost exactly the same size. The center section of NuBall is made here in the states by KASO Plastics. So that it will come off the mold in the injection plastics press, it must have a draft of about 1.5 degrees. Given its length, that means its bottom edge is about 3/16 inch wider than the top. The base of NuBall has a channel all the way around it, just inside the edge. The plastics engineers at KASO designed the pointy tabs on the bottom of the center section so they would extend down into that channel, positioning the center onto the base. It does leave a very narrow gap around the top edge of the base. A little air leaks out there - but notice there are big vents in the sides of the base anyway. The air lost thru the gap is small by comparison, and does not affect NuBall's function. We have done all our testing and measuring with that gap in place, and it has no effect. We know the reason for it - and the way to do it - are by no means obvious, but once you get it in place, you'll get used to it, and you'll almost forget about it. Basically, baking a ball is a very innocuous process. It does not damage a ball at all. So, you can bake a ball as often as you wish, for as long as you wish. We have baked a ball overnight a couple of times with no ill effects at all. (We did so by forgetting it was running. One thing we want on a new edition of NuBall is a timer that will shut it off when a set amount of time has passed. As a practical matter, say you carry 4 or 5 balls and use most of them at least every few days (fairly typical for a lot of league bowlers). Just run them all through NuBall about once every 3 weeks. Doing it that often, you should never notice any degradation of performance.